The specs are a bit different on the bike we received to test — a SRAM 1×10 drivetrain with a single ring up front and a chainguide replacing the front derailleur being the big standouts. Also, the test bike has Avid Elixir 1 hydraulic brakes rather than the DB3s on the current spec sheet. 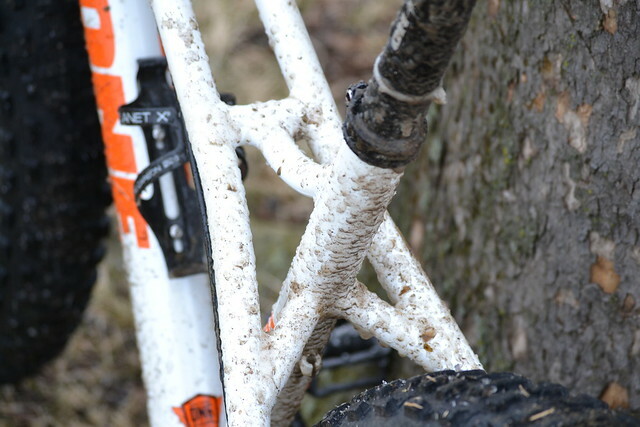 As you can see from the photograph above, the snow started melting the day this bike was delivered to my door. So, we’re going to have to wish for some additional snow before we can do a lot of testing. This bike is a bit of a departure for us…it’s not exactly a typical “commuter bike”, and there may be more useful bikes/bike setups for winter riding than a fat bike. But, we wanted to see for ourselves what all the fat-tired hype is about and share our experiences with you. 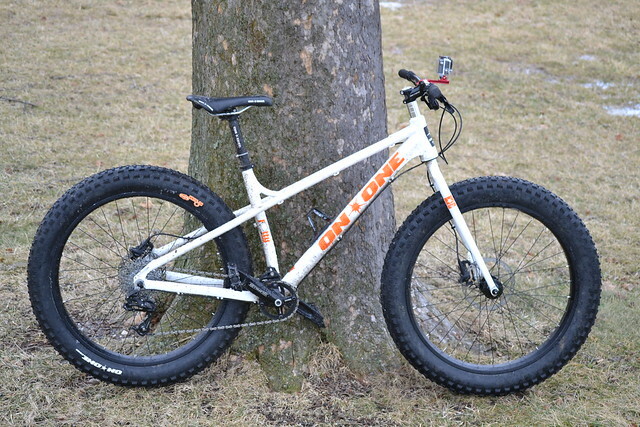 Perhaps a fat bike like the Fatty here really IS the “must get to work no matter what the weather” platform we’ve been looking for? Stay tuned for updates and the review itself over the next few weeks. In the meantime, I’m going to be out getting filthy and putting a big ol’ smile on my face. Frozen slush, anyone? So much going on in Chicago lately… namely, it seems that winter has (finally) arrived. (Note: you will hear no complaints from this bike commuter about the mild weather and temperatures in the 40s and 50s these past few weeks…) From a few headline searches, Chicago isn’t alone in bracing for winter’s impact. 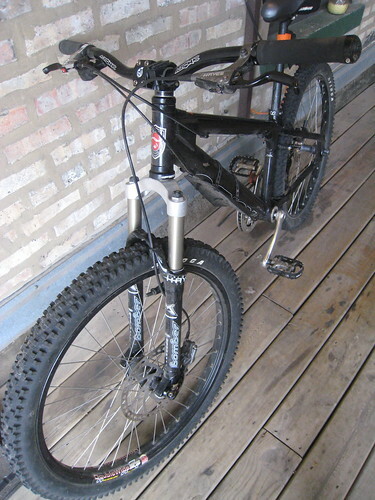 Now apparently Chicago is just gearing itself up for a true Winter Bike to Work Day this coming Friday. Enjoy coffee and tea from Caribou and Cheesecake from Eli’s 6:30 to 9 a.m. The first 50 bike commuters who come by the event can choose from either a free bike light or a free balaclava. Everyone who stops by can enter a raffle for a folding bike. Winter Bike to Work Day takes place on Jan. 20, the 27th anniversary of Chicago’s coldest day, when the official temperature at O’Hare International Airport was 27 degrees below zero. 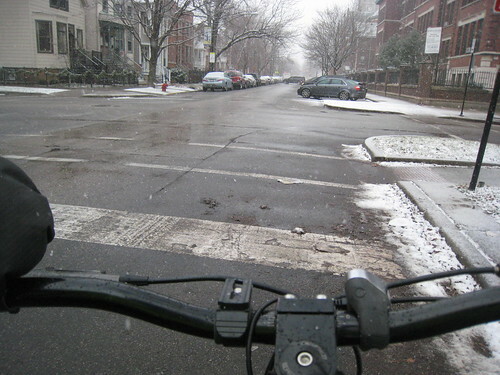 Last Thursday the city of Chicago experienced the first significant snowfall of this winter cycling season and today flurries lingered but did not accumulate. For the next few days, more so than snow, Chicagoans face the bitter cold temperatures with “real feel” temps hovering in the single digits! If you’re lucky, the windchill will just barely keep the temperatures above freezing for your commutes in on Wednesday morning. In anticipation of winter’s arrival, I have been lent a snow bike to test out. Last Thursday I put the snow bike to the test and she performed, especially for the ride home on Thursday over the snow covered streets. 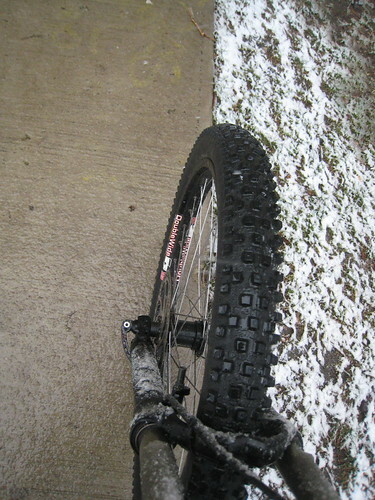 The double-wide fat tires on this puppy – though not studded – did keep me feeling more stable on two wheels. Unfortunately such a downhill bike does not come with fender mounts, so I popped on a mudguard for spray from the underside and a rear clip-on fender to the seatpost. This bike’s front disc brakes assured me that I would have stopping power when I needed it. Neither the tires nor the brakes let me down. Unfortunately, I think the brakes need adjustment as I could notably feel resistance in the wheel that kept it from spinning freely. 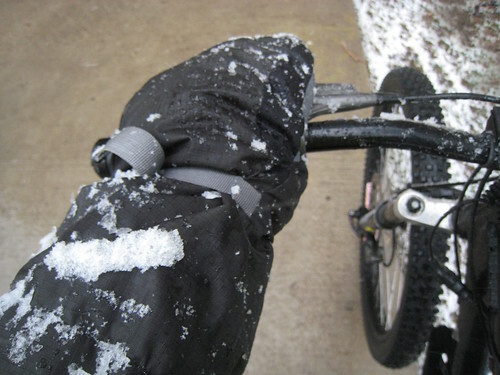 Still – in the wintry bike commuting conditions of last Thursday night’s ride, I certainly wasn’t riding anywhere fast. The bike cops that were out patrolling acknowledged me with a smile and a nod; I think we were equally impressed to see each other out on the roads that evening. The roads in Chicago are usually pretty well plowed and salted, as was the main east-west street I take leaving work. Salt riddled its damp pavement. But then I turned northbound; the rest of the way home I navigated my way north on mostly snow-packed roads. This type of snow was the slippery kind that makes it hard to gain traction and the roads were such that all of the road had already been driven over and packed down; these roads were some of the worst road conditions I’ve ever encountered on a commute for that much of my route. Luckily, there were few cars on the roads. I just tried to steer clear of the fish-tailing cabs. At long last I made it home and had to haul up the bike to my apartment. At that moment I realized the heft a front disc brake adds to the bike; I like to think that the added front-end weight helped in my snowy journey. 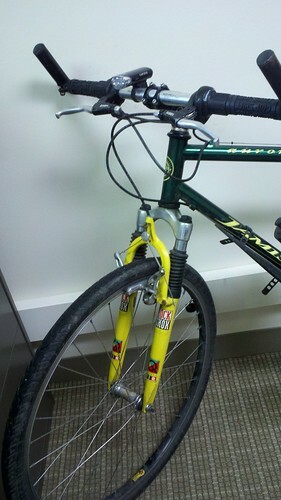 For the final trip up my steps, however, it added to the inconvenience factor of using such a bike on a regular basis. Today weather forecasters predicted possible snow accumulations of 1″-2″ but only a dusting of flurries stuck to the pavement. For today’s adventure, I put the Green Machine back to work, more than a full month later than it was called into action last winter season. 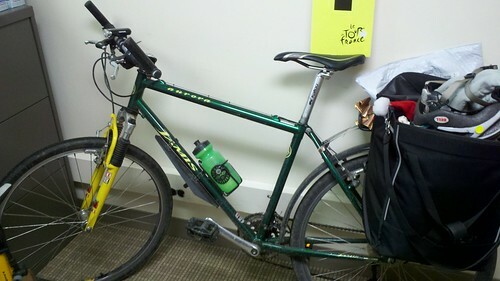 Tomorrow I may add MTB Barmitts to the Green Machine to add further buffering from the windchills. 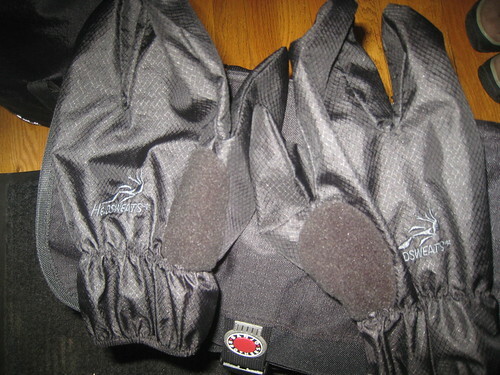 Up until now, my REI mittens have served me well, but do not allow full dexterity for grip and brake controls. Tonight’s commute home wasn’t so bad. The challenge was mainly in breathing; in the cold temps I pull up a buff over my nose and mouth which keeps the air warm and moist but still doesn’t solve the runny nose dilemma. I had pulled down the buff entirely by the end of my commute. Still I arrived home refreshed and breathed a hefty “Ah..” in the crisp night air. I glanced up and to my amazement saw clear skies and a sky above full of twinkling stars and some visible constellations. For a city gal, seeing stars from my place is a treat.. and it’s one reason I do enjoy the crisp and clean (dare I say refreshing?) cold winter air. I love the clear wintry night skies! A special thanks to my coworker for snapping the photos of the Green Machine you see in this post.